Since I have prepared some of these muffins for my kid’s breakfast, I have decided to have some new picture taking to supplement the post. 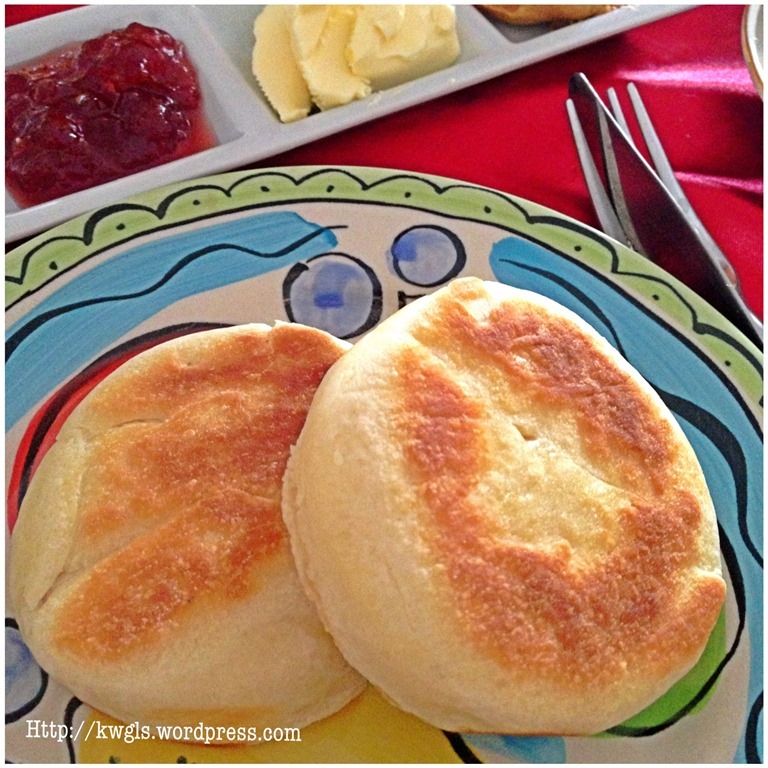 I have pan fried all the English Muffins rather than baking. 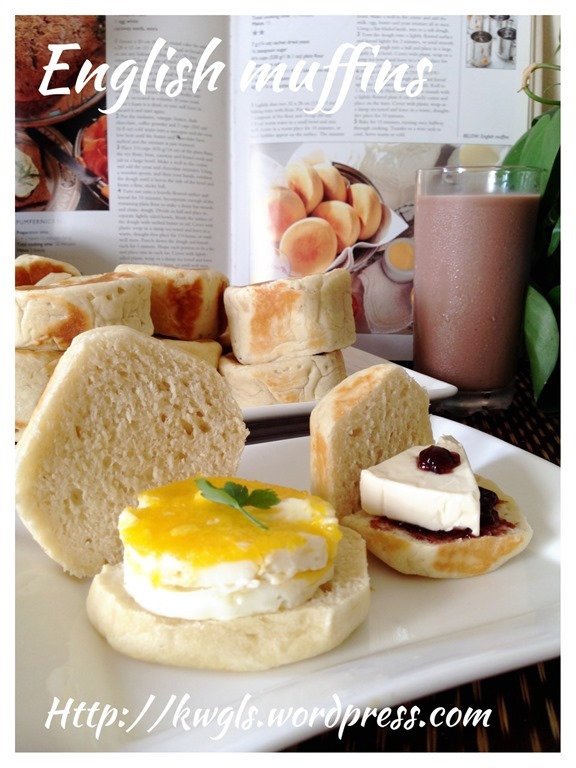 English muffins caught my attention in one of my old cook books (“The Essential Baking Cookbook” published by Murdoch Books in year 2000) that I bought more than 10 years ago. 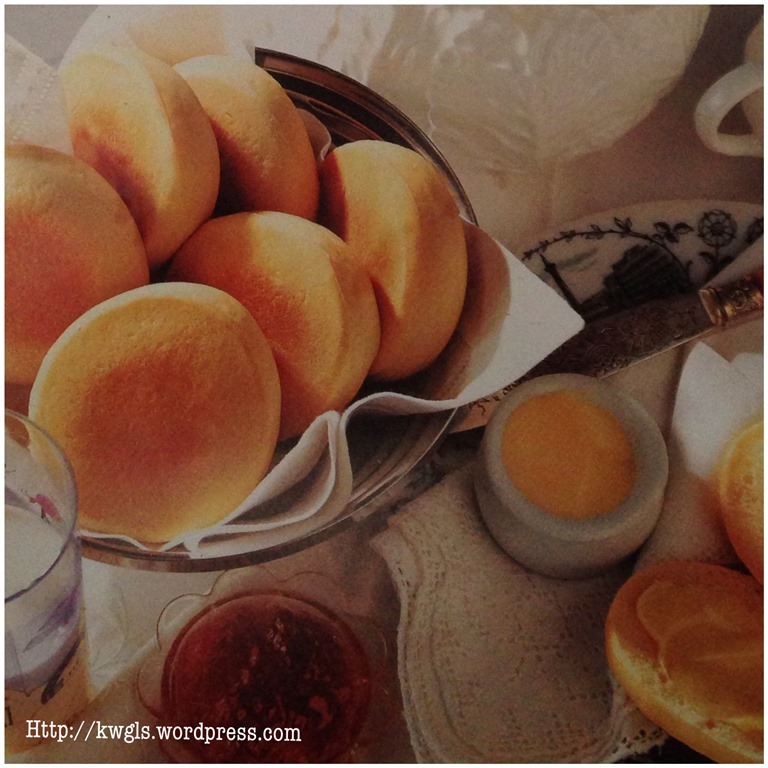 It is not because of the word “English” or the word “muffins” but the shape of the muffins. 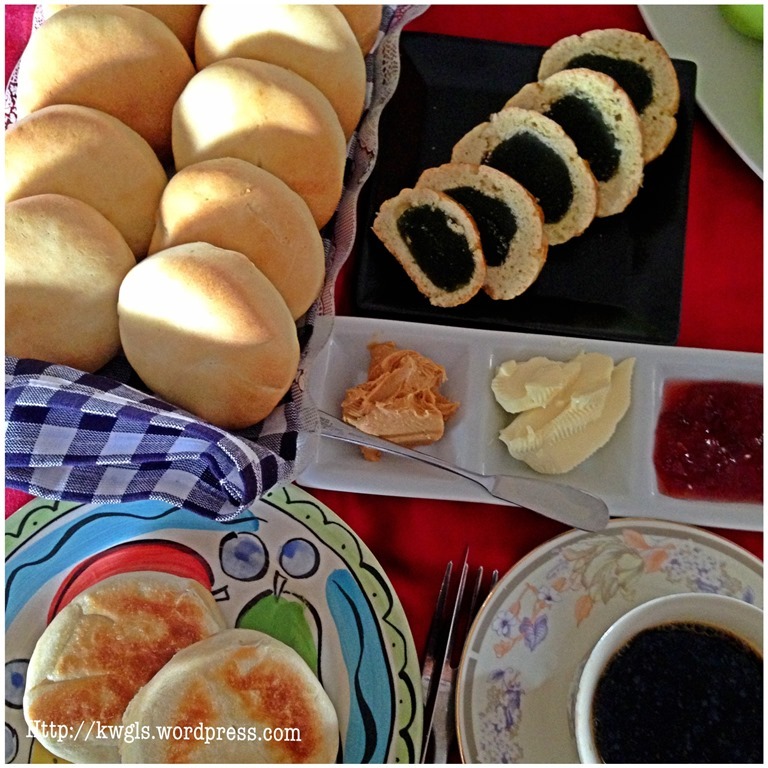 When I looked at the picture, it immediately remind me of the red bean paste bread that Doreamon like to eat. 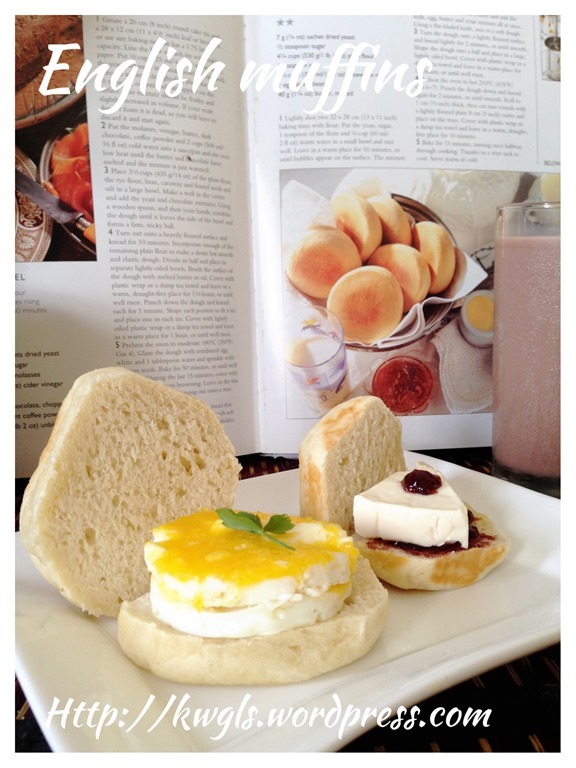 (Note: I know very clearly the two bread are not the same as English muffins will definitely be denser than Japanese breads). It is flat, light coloured and looks soft and I told myself that I must try to prepare it. The muffins just looked so plain but elegant. Two days ago, I followed the recipe in the book with slight modifications and the outcome is less than desirable. I sincerely believed that it may not be the recipe’s inaccuracy but it is more of my own faults in measurements and timing. I have posted my failed attempt pictures in Google Plus Communities and asking my circles of friends to help me identify the possible causes. Below is an excerpt of the correspondences. 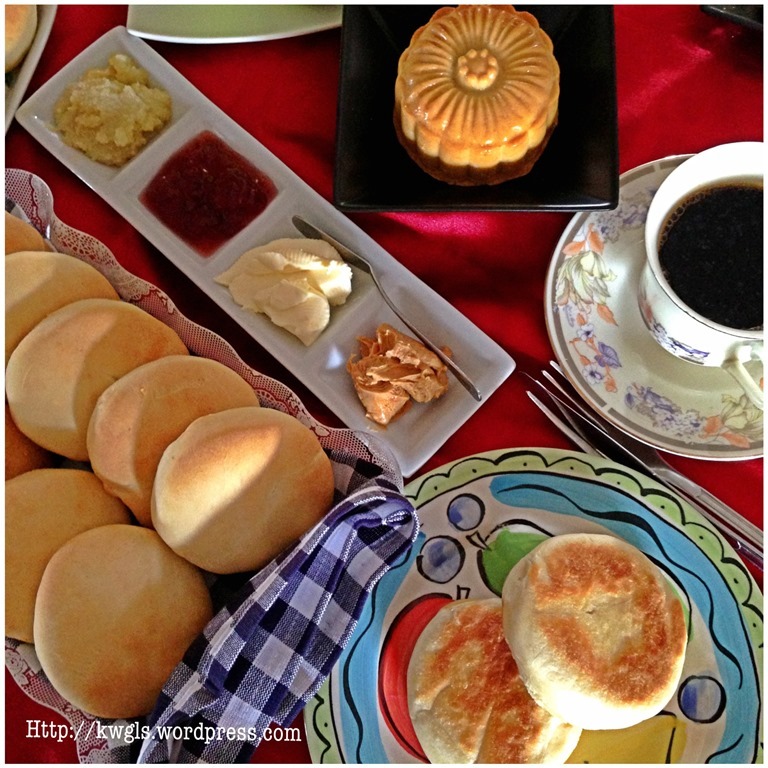 “ Dear friends, I am baking a batch of English muffins this afternoon. And this is how it looked like. Is it normal? What is happening? Any feedback is appreciated! Today is hot, even before the stipulated 1.5 hours, it is more than double in size. I think the culprit is either I measure incorrectly the weight of dry yeast or over proofing. It look easy but it is quite tough actually. Friends C, really thank you. 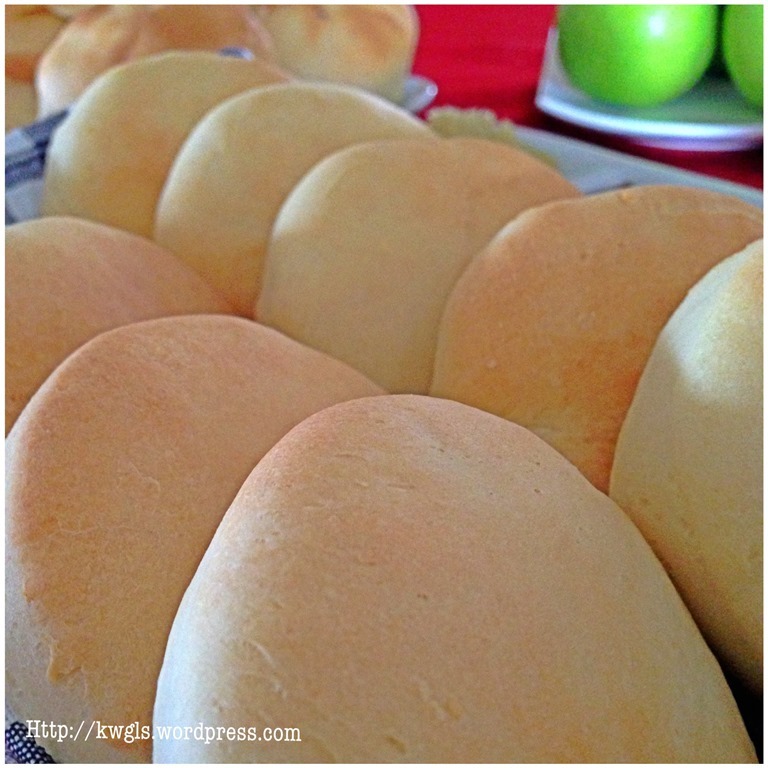 I knew it should be flat like some sort of Japanese bread, smooth and soft. Attached please find the recipe. I cut mine straight after kneading and then only proved for an hour (about 20’c here) and they weren’t quite doubled. I didn’t bother with a second prove. 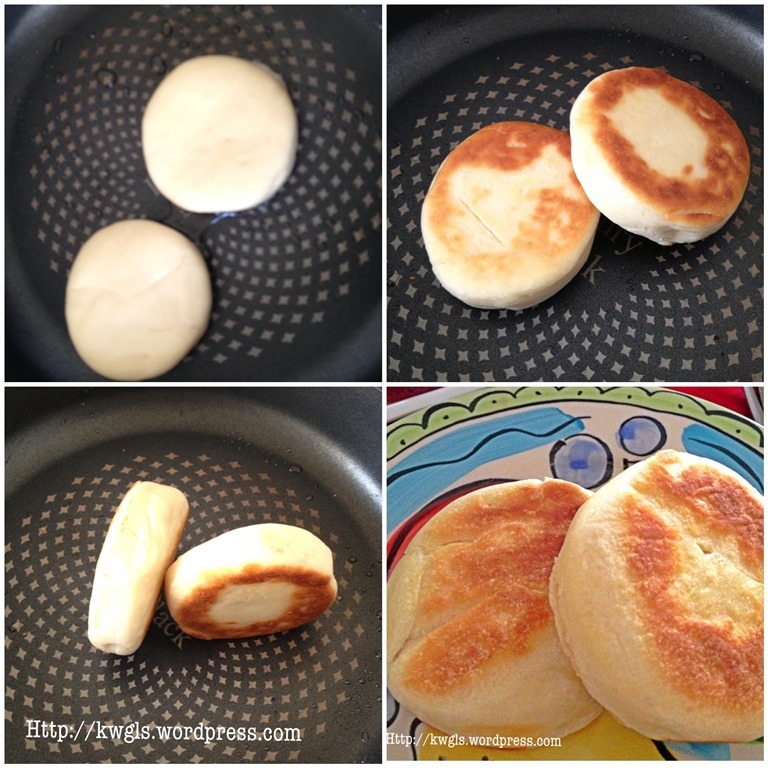 They are not baked, but cooked in a frying pan or hot plate on the hob, where they continue to puff up. 7 minutes each side. 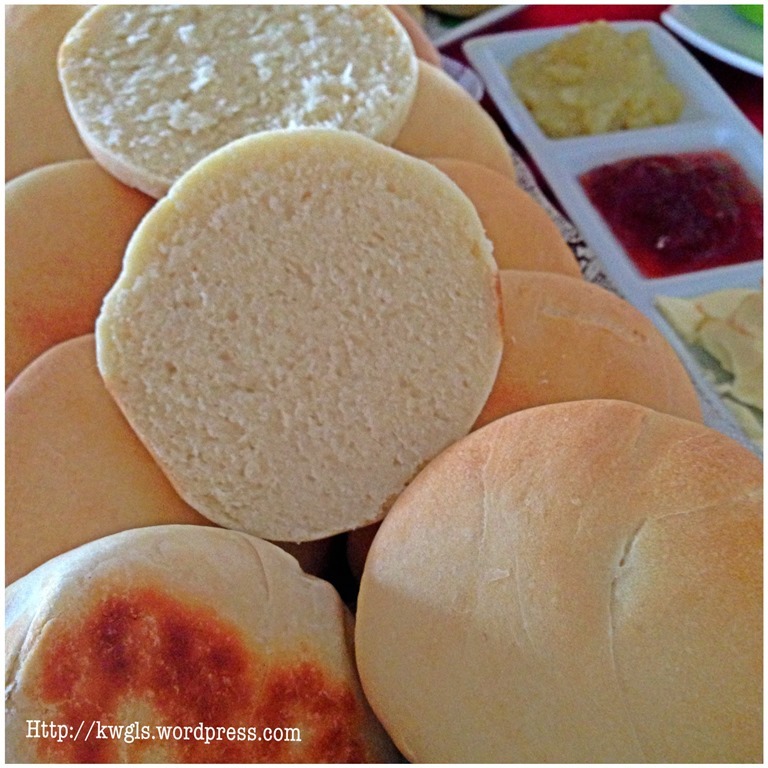 Select some for pan fried and the remaining were baked. With the above kind advises, this is what I get for the second batch. Pre-heat oven to a hot 200 degree Celsius. 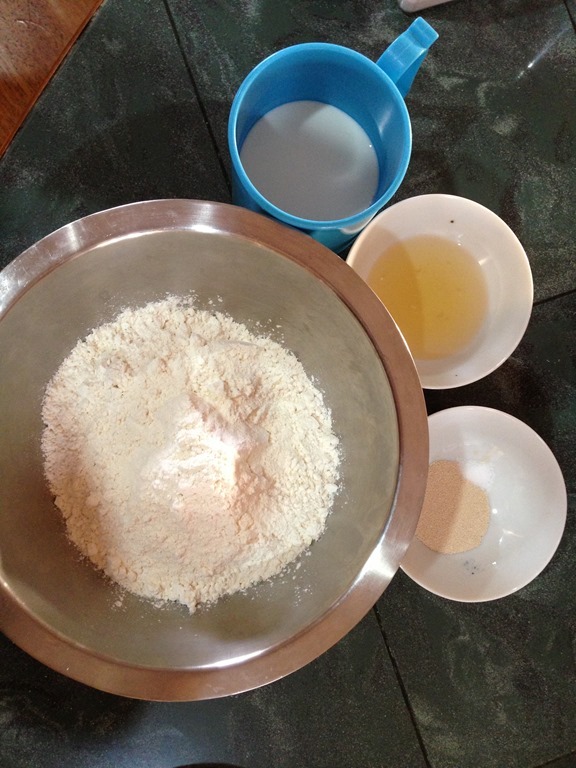 In a big mixing bowl, put in plain flour, lukewarm milk, yeast, lard, salt and sugar. Knead until well combined and smooth. Use a roller spin to flatten the dough with about 1.5 cm high. 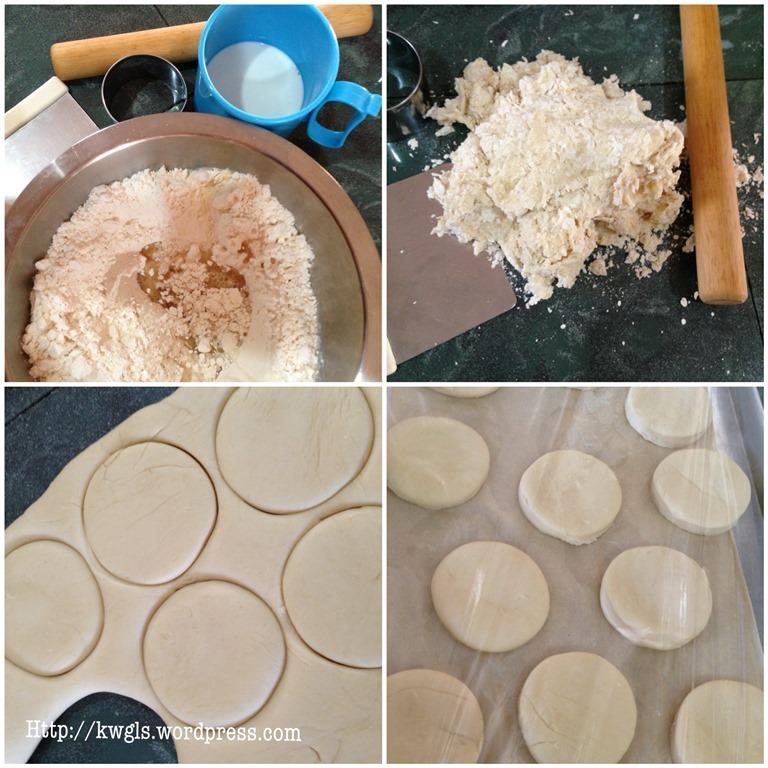 Use a 8 cm diameter, 1.5 cm high circular cutter and cut the dough into rounds and place in a baking tray with a sheet of baking paper on it. Use a plastic wrap to cover the dough and prove for 45 minutes to 60 minutes. Once done, bake in the oven for 15-20 minutes , turn once halfway through cooking. In a frying pan, put 1 tablespoon of lard or butter or cooking oil. Pan fry the dough at medium heat for about 6 minutes a side. You will witness a rise in dough. Turn to the other side and fry for another 6 minutes or when the colour start to turn golden yellow. 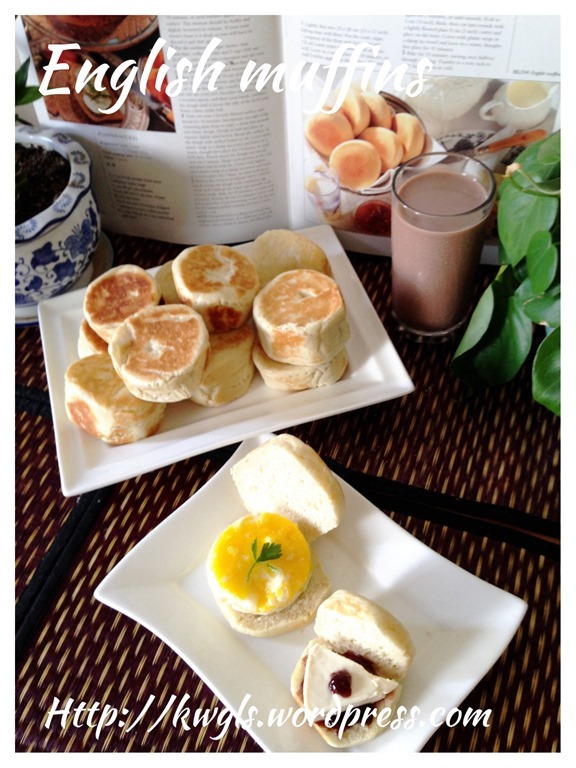 You can also sliced the muffins and pan fried on each side if you found that the muffins are under cooked. 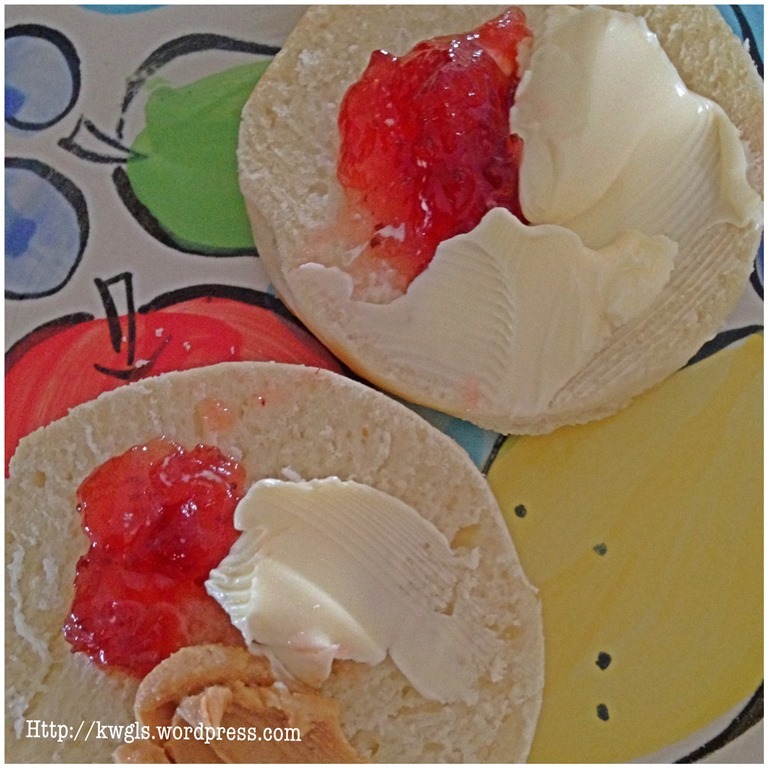 A relatively easy to make breakfast item. It can be as healthy as you want it to be. Of course, lard is optional and you can substitute it will the healthier olive oil. 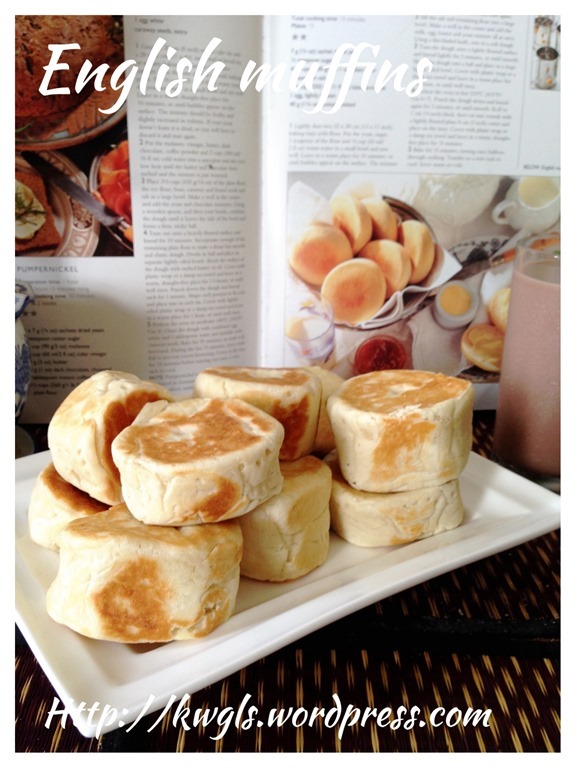 You can opt for the baked version instead of the pan fried version. 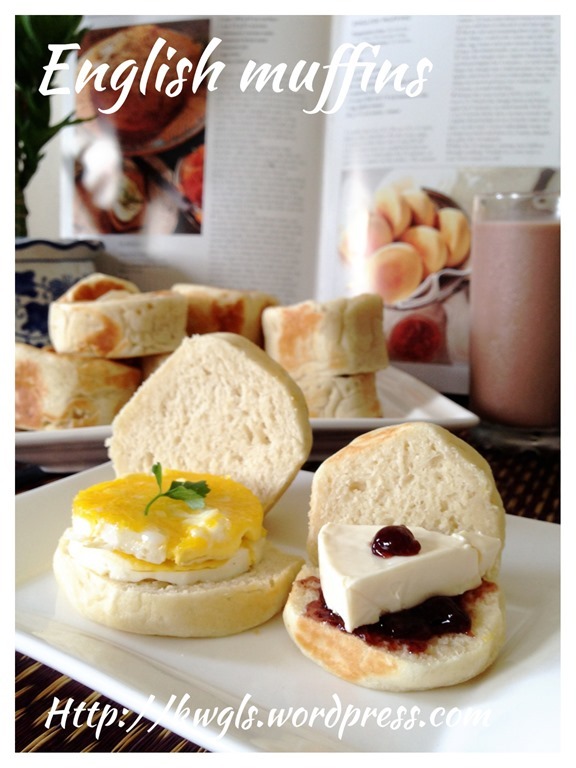 Though simple, it is equally tasty and I will definitely want to make it again and eat it with scrambled eggs or fried eggs. I have analysed the possible reasons for the failure of the first attempt. One is the incorrect measurement of yeast volume. I always have difficult to measure yeast as they are very light and some weighing scales are not sensitive enough to detect the volumes. Secondly, the proofing time is too long. While recipe book is a reference, however, I should have taken into consideration of the local weather conditions which is at least 33 degree Celsius that afternoon. 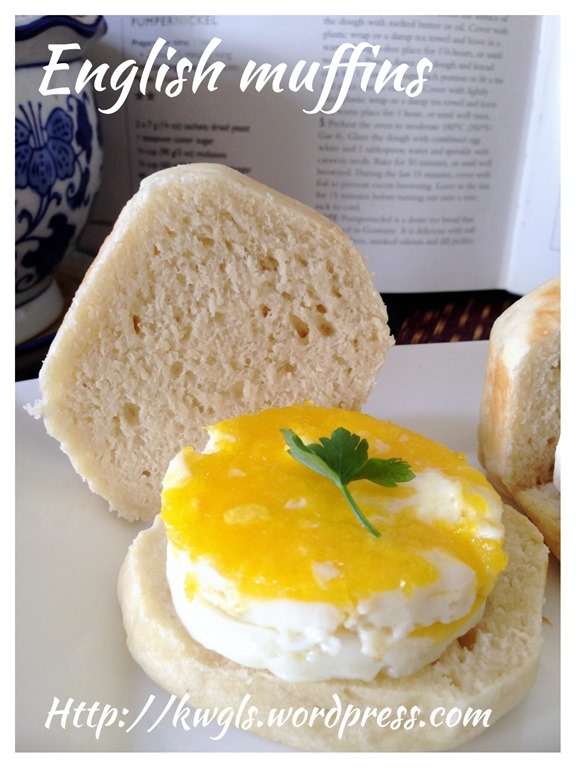 However, never seen how a English muffin looked like make me unsure of how I should salvage the situation. Thirdly, I may not have added pinches of salt in the first attempt. Salt had the ability of inhibiting of yeast fermentation and without such minute quantity of salt, the dough can become a volcano as the yeast are happily having party in the dough without presence of any “salty” policemen! ha-ha. I still refused to conclude that the recipe source is to blame though the volumes and procedures have been altered rather significantly. I would chose to believe that it is more because of my own mistakes. 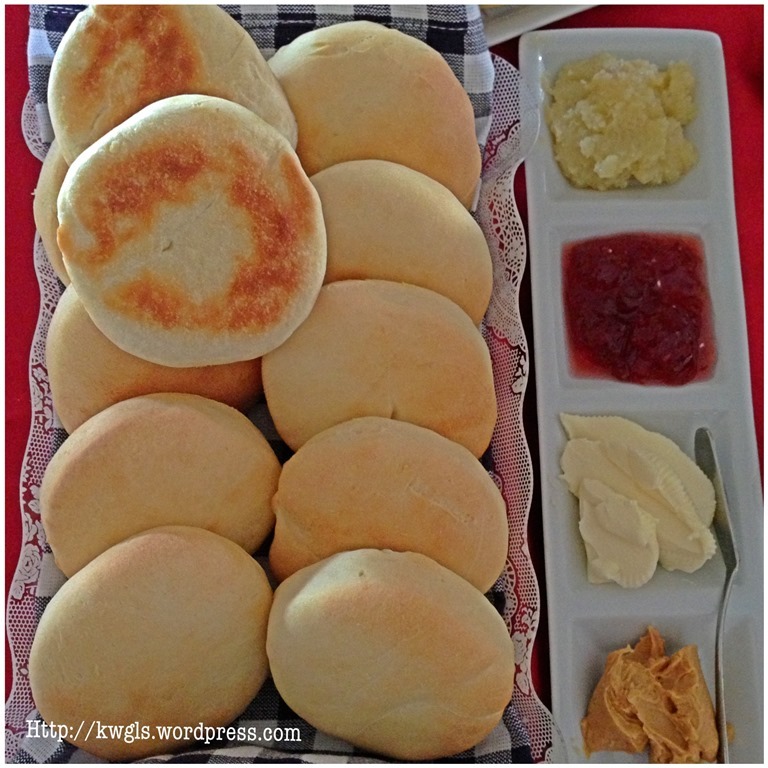 But via discussions with my friends in Google plus communities, I have cut short the method and yield the English muffins acceptable to me. I honestly, sincerely and faithful wanted to thank my 3 friends who offered me valuable advises voluntarily. Without their valuable advises, i do not think that I am able to share with readers about this baking adventure. 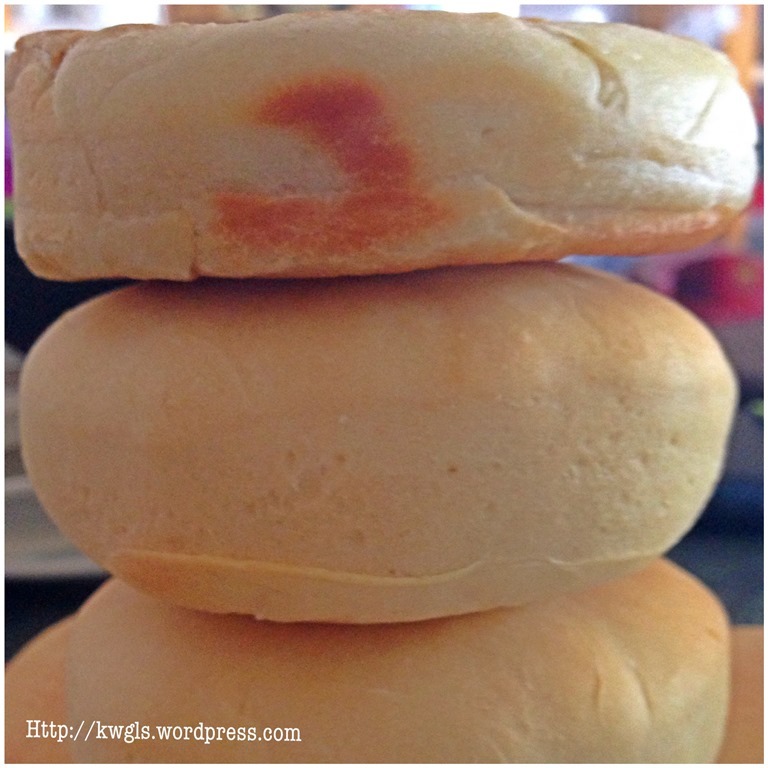 This entry was posted in Breads and Pizza, Food Preparation Series and tagged 8, english muffins, 英国松饼, GUAI SHU SHU, Guaishushu, kenneth, postaday. Bookmark the permalink. Thanks for your comments on my party food in Facebook, Kenneth! Nice space here & very information post you’ve got. 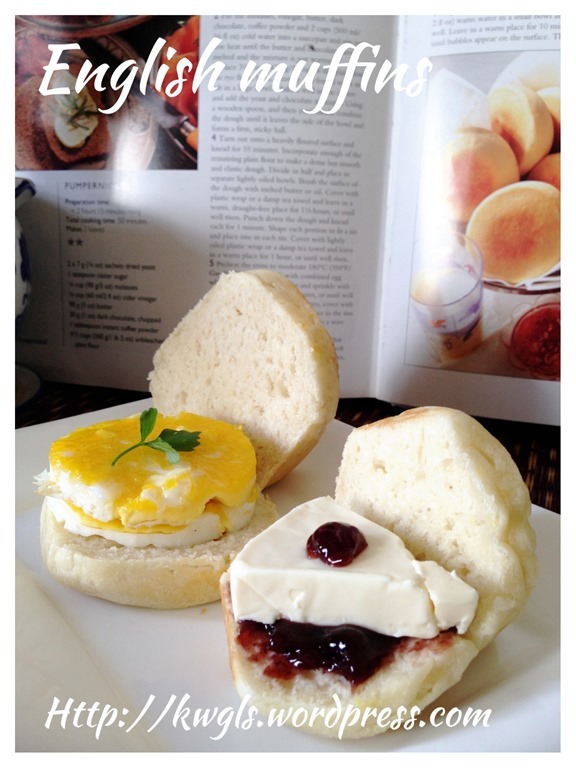 I love English Afternoon Teas & good muffins are a must. 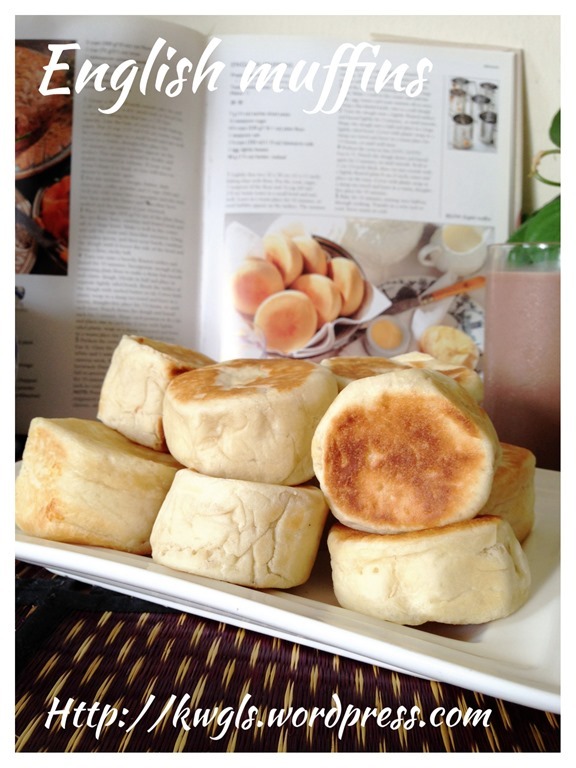 I’m really fussy when it comes to food, so I would rather not bake muffins myself. I’m afraid the outcome would be a disaster. Lol! I’m following you at Twitter & looking fwd to sharing! Happy weekend! Thanks, Shirley. I am glad that you like the post. I like to trial and error and simple ratio.. You should try the lard version and I was so shocked that one of community friends told me that they uses lard. Though not that healthy but heavenly nice. Thanks for being my friends and I am still trying to locate your blog and I am sure there are lots of things we can discuss! Cheers and thanks for dropping by. It is good when the trial and error makes you learn. I enjoy those experiences. But the muffin does look really nice. Never had it pan fried always baked. Will try it! I loved the pan fry version. Look more yummy. Will try and thanks so much for sharing your trial and error experience. Xie Xie. Hi Kenneth, you indeed made it so easy! Thanks so much!!! Hi May I know can the dough been freeze for future use?